In 2015, 73% of CEOs cited the ‘skills gap’ as a key concern.² In 2016, contention has come to the fold as to whether the skills gap actually exists, or is a result of unrealistic expectations of C-suite executives.³ Regardess, the world has shifted toward increased professional development and contining education, as competition in the global workplace continues to evolve. The fact that you’re reading about career advancement right now indicates you already know you need to learn and adapt constantly, if you intend to remain relevant. 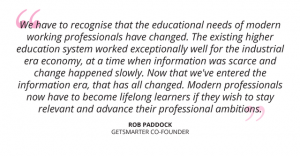 In an economy where specialised knowledge is increasingly rare and highly rewarded, it’s important to put a lot of thought into what you want to learn today, to get where you want to be tomorrow. Ask yourself: What’s my dream project, personal or professional? What’s been stopping me from making it happen? When and where do I feel least competent? What am I really passionate about? What can I do that will earn me money? The ultimate test of whether or not you’ve chosen the right online short course to advance your career is asking your employer to pay for it. In a world where employers and people management professionals place evermore importance on employee engagement and development, your company agreeing to fit the bill is perfect validation of the skills you’ll acquire on your short course. You’d be surprised at how many employers are happy to pay for their employees’ professional development. 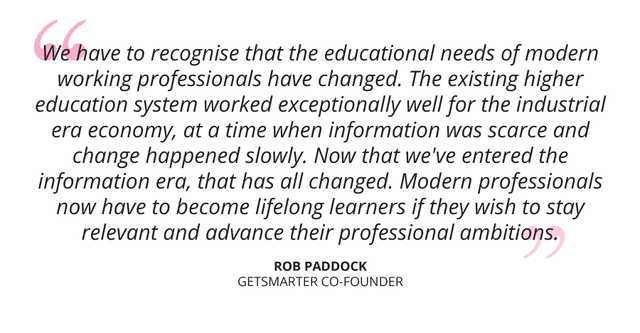 In fact, over a quarter of GetSmarter’s online digital learners have reported that their employer paid for their course. There’s no harm in asking. When you sign up for an online short course, you’re signing up for more than just an education. During the course, you’ll be granted access to a network of vibrant, like-minded professionals who you’ll be collaborating with for the duration of your learning journey. Don’t underestimate the value of forging real connections with the people you engage with during an online learning experience. That includes your course instructor. Share the valuable resources you come across while you’re researching assignments, connect with them on LinkedIn, and, if they’re in your area, try and meet up for coffee. You never know: reaching out to someone you admire, or someone you feel you could help along their career path, could lead to a valuable mentoring relationship for both of you in the long run. Add your new online short course qualification to your resume and LinkedIn profile. This can be done in LinkedIn through either the education section, or by adding a course or certification. In addition to highlighting your newly-rounded skillset, it will indicate your willingness to continually improve – showing both current and prospective employers how truly valuable you are. Thinking about starting your online learning experience?